This recipe is traditionally made just before serving the dish. It can, however last all day if it is kept in the oven at a constant 60C. Prepare the clarified butter by gently warming it in a pan and skimming off the surface froth then carefully pouring the butter into a bowl ensuring the milky sediment is left in the pan. Keep it slightly warm. Bring the vinegar, peppercorns and water to the boil in a small saucepan and reduce by about a third. Leave this to cool completely then whisk in the egg yolks. Pour the mixture into the glass bowl then place the bowl over a simmering saucepan and heat gradually, whisking all the time to emulsify the contents. It is vital not to let the temperature of the emulsification to rise above 63oC or it will begin to split. If it does begin to split, take the bowl immediately off the simmering pan and add ice cold water. 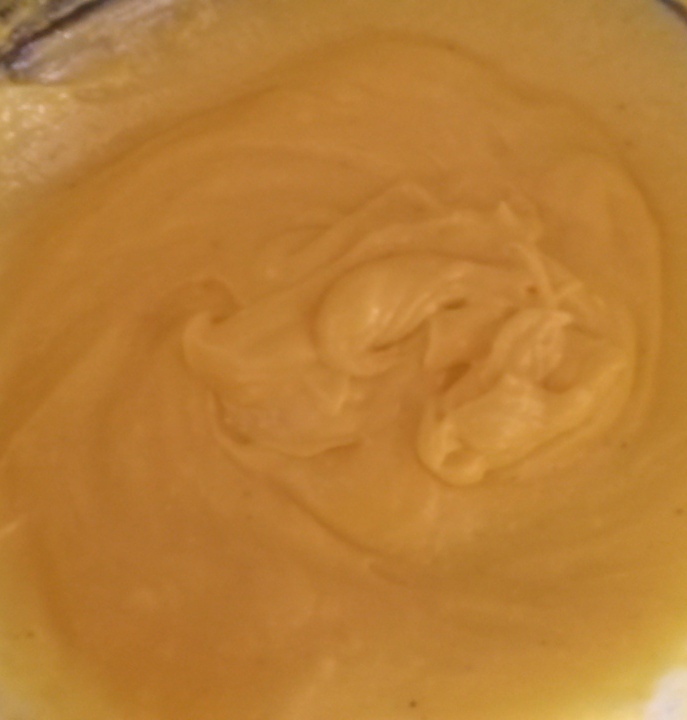 After about eight minutes of whisking under the controlled heat, the contents will become very smooth and creamy. Take the bowl off the heat and whisk in the tepid clarified butter. Then whisk in the lemon and truffle oil. The sauce should have the consistency of mayonnaise. 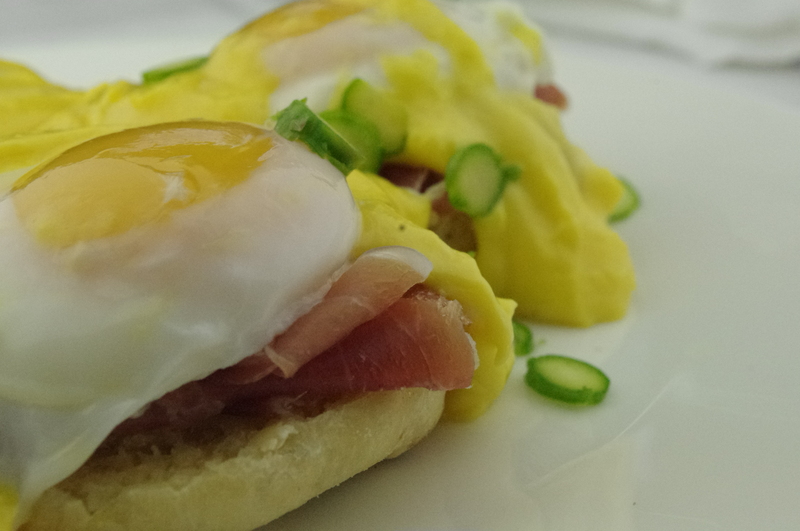 Eggs benedict has to be one of the naughtiest breakfasts in existence. One particularly fine specimen is to be found in the Mandarin Oriental Hotel in Hong Kong. Who can resist waking to a strong coffee and taking in lashings of hot butter sauce on soft poached eggs, soft ham and toasted English muffins. The key ingredient is hollandaise sauce. 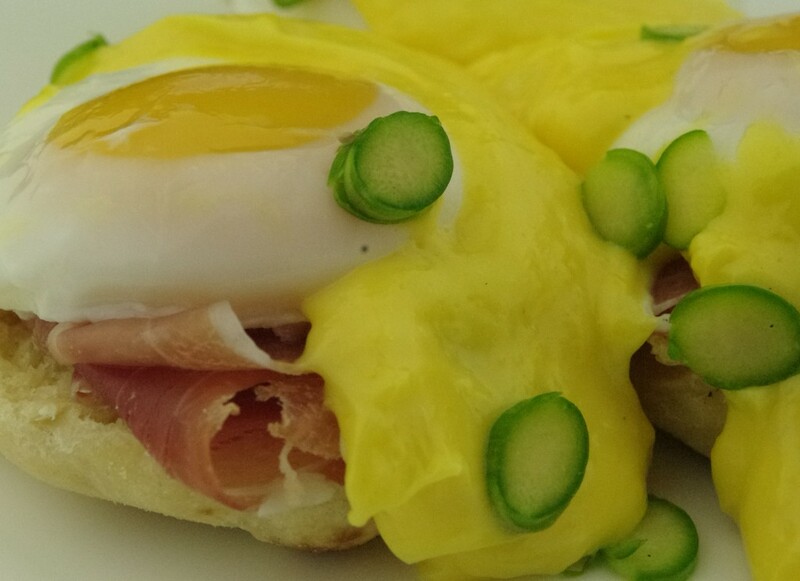 The very best hollandaise recipe can be found in this post…piquant and delicious! For extra luxury, I have added truffle oil. Lillet blanc is for me a most versatile French aperitif wine. Made famous when it was originally branded as Kina Lillet in Vesper’s eponymous cocktail in Flemming’s Casino Royale, it is a most underused of drinks that works fabulously as a mixer. I have used it here in a piquant sauce reduction. In a small frying pan or skillet, dissolve the sugar in half the sherry vinegar, add the Lillet blanc and reduce by 3/4 or until the liquid becomes quite syrupy. Take the pan off the heat and add in the other half of the vinegar. 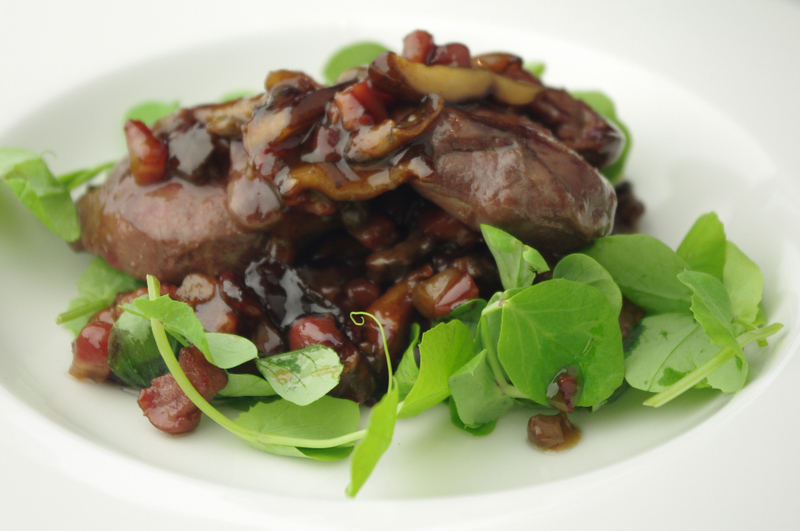 Sauté the pigeon breasts in a large frying pan until they are seared and just turned brown. add the pancetta, livers (if using) and mushrooms and sauté the contents until they appear to be cooked. Add the Lillet Blanc reduction and stir until the contents of the pan are glazed in the sauce. 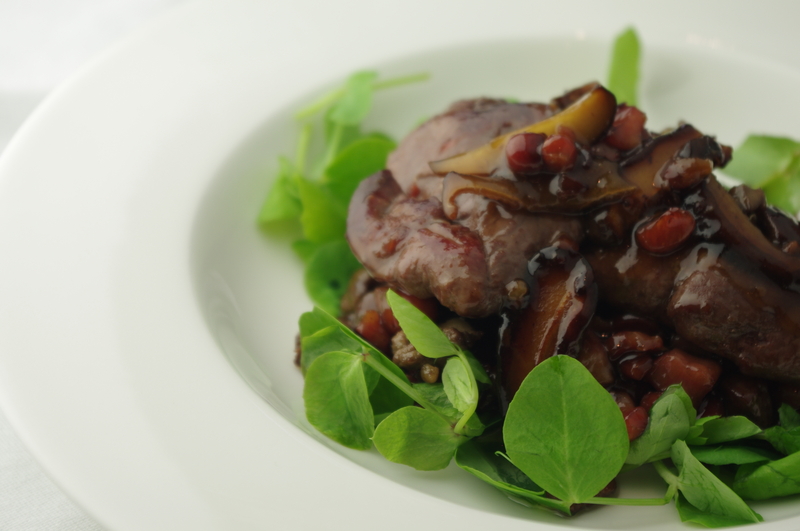 Make a base of pea shoots in a dish. In the centre of this, add a layer of glazed pancetta and mushrooms, then layer the breasts on top of this. Pour some retained glaze over the breasts and serve. This dish has been loosely inspired by my trip to Sicily where beautiful fish and seafood abounds to tantalise the senses. 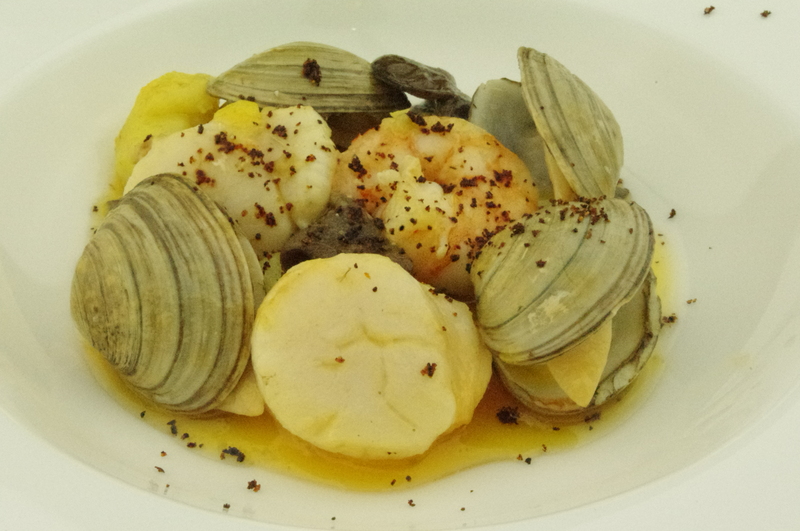 The seafood infuses into the butter so beautifully to give it that silky, rich flavour. It is heavenly. Feel free to use pre-prepared gnocchi. I feel, however the home made ones are truly delicious. Sadly I am unable to easily source seaweed. 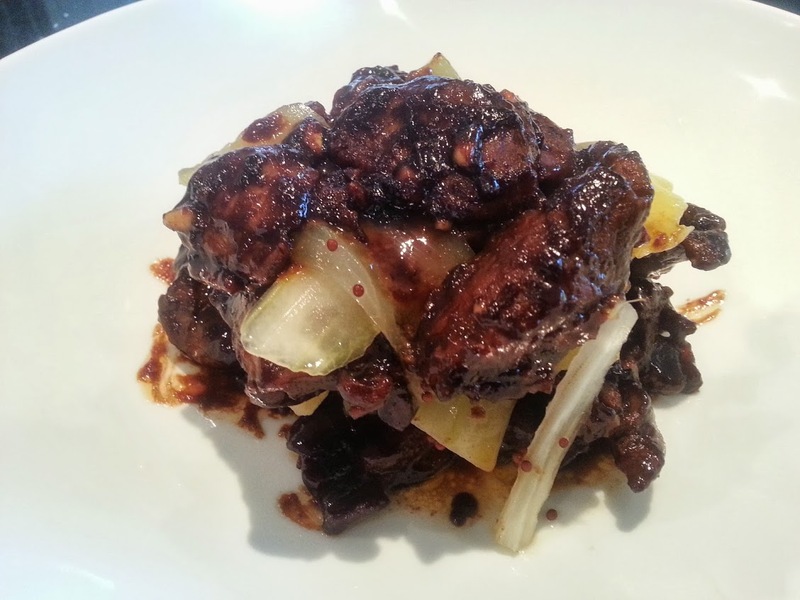 I have substituted wood ear black jelly fungus which has a similar texture, if not flavour. It is readily available from Chinese supermarkets dry for reconstitution by boiling for about an hour. I felt it worked rather well. The tomato powder looks impressive as a garnish on the plate. 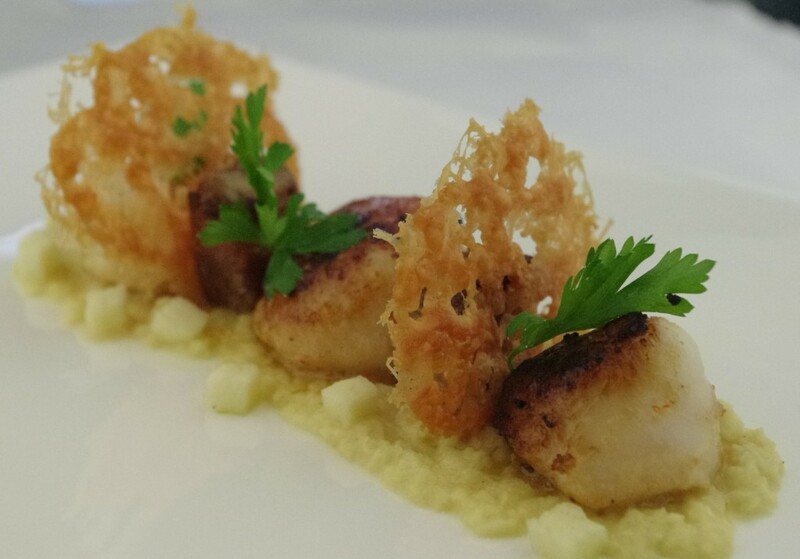 This dish serves 6 people as an hors d’oeuvres. Preheat the oven to 400F/200C. Bake the potatoes for an hour. Remove the potatoes from the oven then scoop out the flesh and pass it through a potato ricer or passatutto into a mixing bowl. Add 1/3 of the flour and all of the egg yolks, salt and pepper then beat together adding another 1/3 of the flour until the dough is smooth. Add more flour if necessary. Roll the dough into a long sausage shape of 1/2 inch (12mm) diameter and cut into 1/2 inch (12mm) length pieces. Roll each piece into an oval shape and, if desired, indent them with the back of a fork to make fluted oval patterns. Simmer the gnocchi in water. They are ready when they have risen to the surface. Remove them carefully from the pan with a slotted spoon and rest them on a kitchen towel to dry. Store them for up to two days in sealed food bags in the refrigerator or for several weeks in the freezer. When ready to cook, defrost if frozen and sauté the gnocchi in olive oil until they are golden brown. Carefully place 4 medium tomatoes in boiling water for a few seconds. Strain the and plunge them into cold water. This will help you peel off the skin. Divide the skinned tomatoes into quarters, cut out the hard cores and push out the seeds. Cut the remaining pulp into small pieces and place on a silpat on a baking sheet. Warm the pulp in a cool oven at 100C/200F for about 40 – 60 minutes or until they have dried without darkening. Allow the pieces to dry then place them in a coffee grinder/miniature food processor and blend until it forms a fine powder. Seafood and lemon are well known culinary partners from preparations of salmon to the time honoured prawn cocktail. 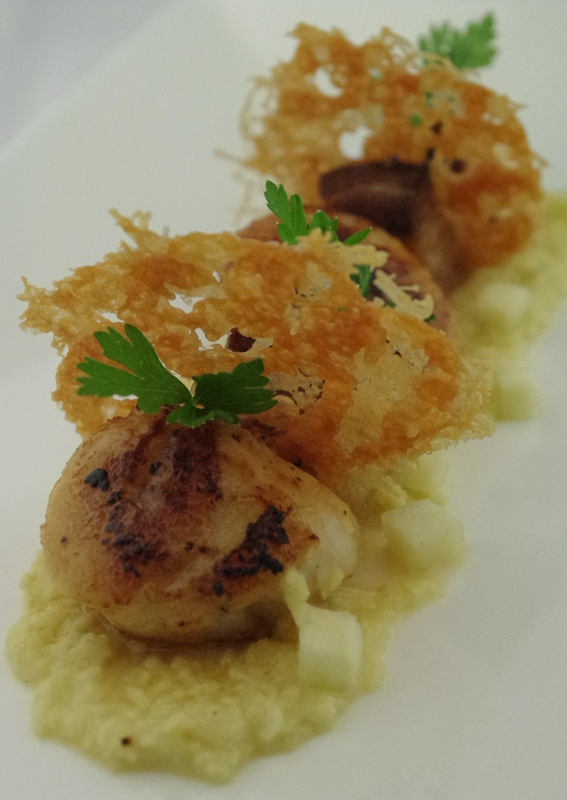 My aim was to produce a piquant seafood reduction with perfect balance of the seafood flavour with citrus acidity. Limoncello as an alternative to cognac seemed to be the answer. I hope you like it as much as I do. 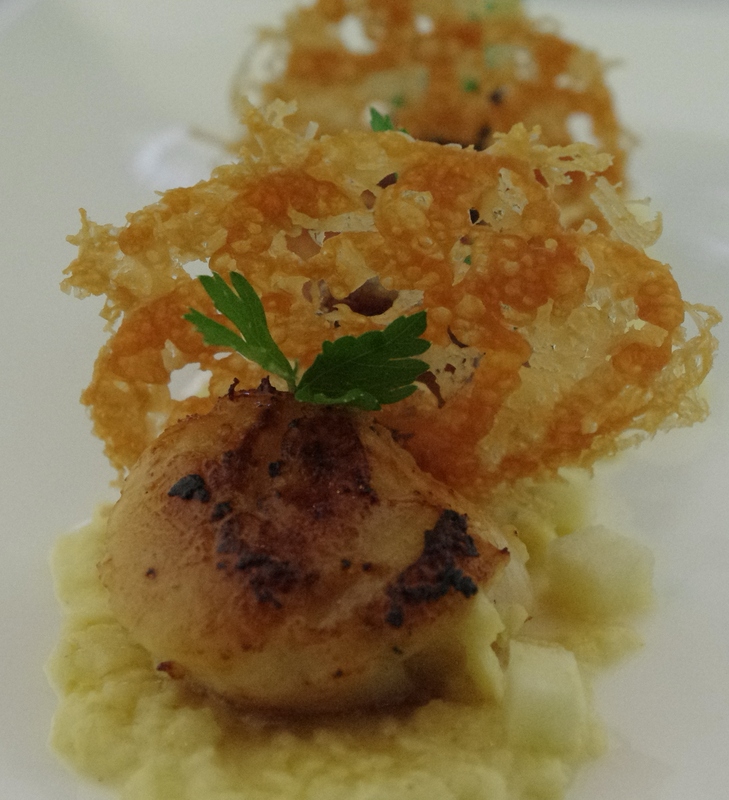 The term quenelle originates from the German word ‘Knödel’ meaning noodle or dumpling. The common fish to use are the more subtle flavoured cod, trout or haddock, although pike is excellent. I have used hake which I feel worked very well. Do not add salt to the stock or sauce as there will be saltiness provided by the baby clams. This dish goes well with crusty bread. Heat the olive oil in a large pot and sauté the onion until it is soft but not browned. Add the rest of the ingredients then deglaze with the boiled wine. Add the bones, stir carefully and then fill the pan with cold water until the bones are covered. Skim off the impurities from the surface frequently as the stock comes to a simmer then cover. Simmer for about 40 minutes. Strain off the stock carefully into a container. Gently warm the butter in a pot. Carefully separate the shells from the prawns. 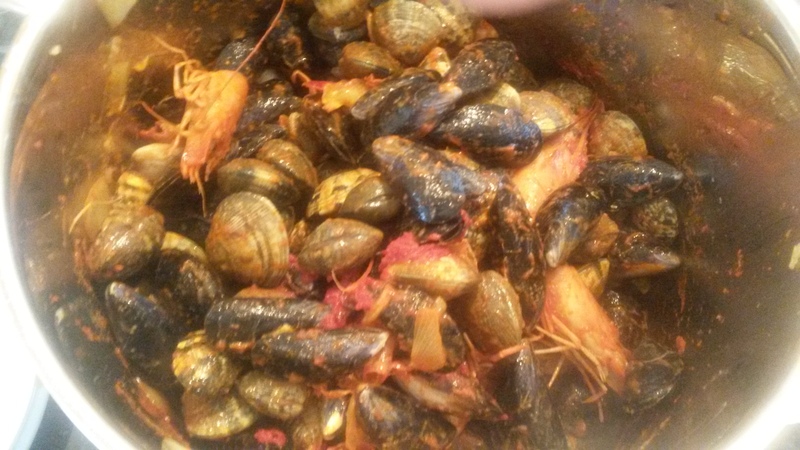 Add the shells to the hot butter and sauté them until they turn red. Remove the shells then add the retained prawns and sauté them gently until they lose their grey colour. Add the tomato purée and stir gently then add the clams, again stirring gently. Add the fish stock and simmer covered for about 20 minutes. Strain the liquid into another pot. Reduce the liquid by about a half then add the lemon juice and cream, Stir then add sufficient limoncello to your liking. Add the beurre manié and whisk until the liquid is thickened. Whisk together the egg yolks and the tbsp double cream. Take the sauce off the heat and incorporate the egg/cream mixture. First gently melt the butter and in a china bowl, mix together the butter with the milk and breadcrumbs to form a paste. Cover with cling film and refrigerate for at least half an hour. Place the chilled paste into a food processor the add the chilled hake fillet pieces and all the rest of the ingredients except for the cream. Blend until the paste is very smooth but not for so long that it is given a chance to warm. Add the cream and combine for about ten seconds in the blender. Transfer the paste into a china bowl, cover and refrigerate. The quenelle shape is achieved with the use of two warm spoons of the same size that are held in each hand. Using the spoon in the dominant hand, scoop out a spoonful of the hake paste. Use the second spoon to scoop out the contents of the first spoon by sliding into the base of the bowl of the first spoon. Transfer the paste back to the first spoon in the same manner. The repeated transferring between spoons will then begin to create a smooth, rounded surface to the paste. Keep scooping back and forth, moulding the paste until you have a smooth oval shape. Bring a wide shallow pan of lightly salted water to a simmer. Carefully place the quenelles into the simmering water for about two minutes then carefully turn them over and simmer for another two minutes. 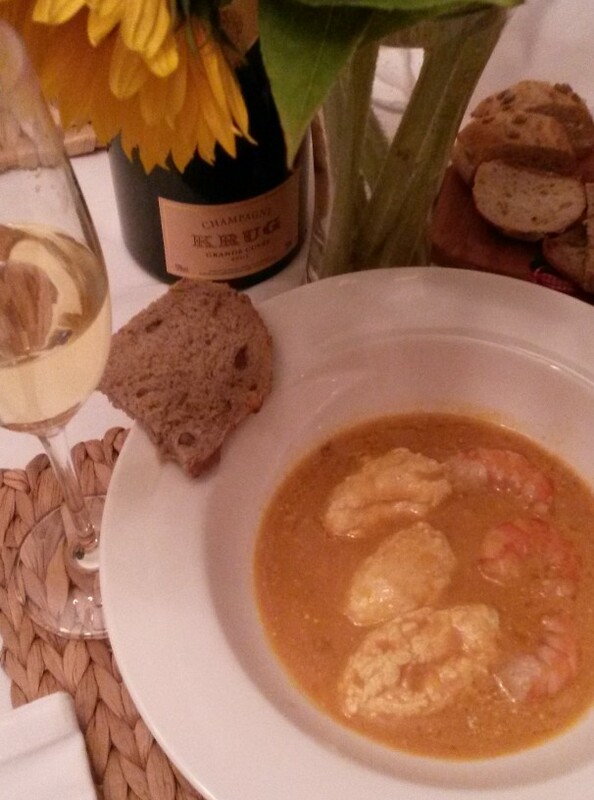 Place the quenelles into a soup or gratin dish then pour the seafood reduction over them. Smooth, sweet soft custard centre cakes with vanilla, brandy and caramelised crust – this delicacy from Bordeaux is one of my favourite luxuries. I simply can’t eat just one. Absolute heaven with a strong coffee, wine or even champagne, I have also seen it incorporated in mini form into desserts. The origins of this little beauty remain unclear although some romantic tales date it back to the 18th century from the Convent of Annonciades. However it was created, it has certainly undergone centuries of refinement to make the superlative cake it is today. You will need special dariole moulds to make this recipe. 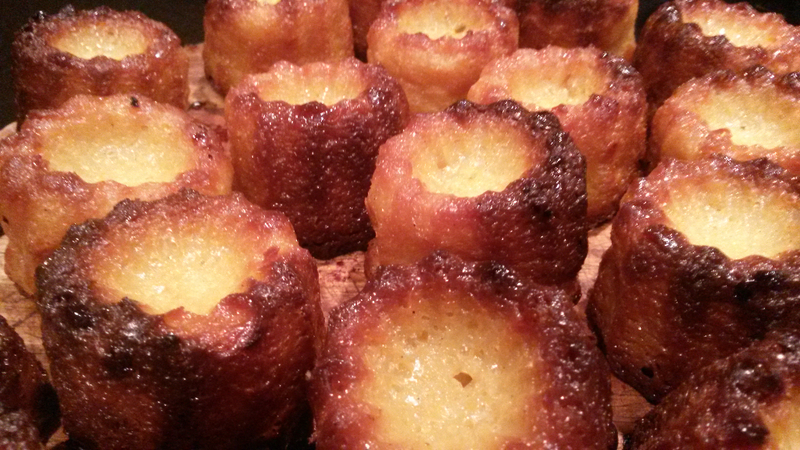 The best moulds are individual tin lined copper ones which transfer heat to the surface of the canelés efficiently. However, they are hard to find and are very expensive. Instead I use silicon moulds. 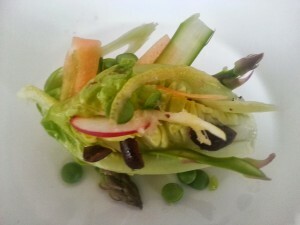 I hope you will agree the end product looks and tastes amazing. 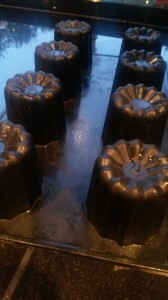 Traditionally, beeswax is used to line the moulds to prevent burning of the surface of the canelés. My solution to the impracticalities of this (a suggestion from a kind friend) is to use clarified butter. 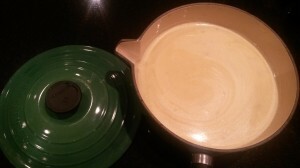 To clarify butter, simply warm butter in a milk pot and allow the milky sediment to separate and sink to the bottom. Pour out the clear butter from the top into a container while carefully leaving the sediment behind in the pan. Prepare the custard 1 day in advance. Combine the milk, butter and vanilla in a pan then bring them to the boil. Let the mixture cool for a short while. In the meantime, combine the sugar and flour in a bowl, then whisk in the eggs and egg yolks. Pour this mixture into the hot vanilla-infused milk and gently stir it in until the resultant custard forms a pancake-like batter. Allow it to cool then mix in the rum. Transfer it to a china bowl, cover with cling film and refrigerate overnight. The following day, preheat the oven to 250C/495F. Liberally grease the lining of the moulds with the clarified butter then coat the greased insides of the moulds liberally with sugar. Gently shake out the excess sugar. Place the moulds on a baking sheet. Pour the batter into each mould, filling them to no more than about 90% to the top. Place the filled moulds with the baking sheet into the oven. After 5 minutes, reduce the oven temperature to 175C/350F and continue cooking for 60 to 75 minutes. The canelés are ready when the tops form a brown crust but are still moist inside. 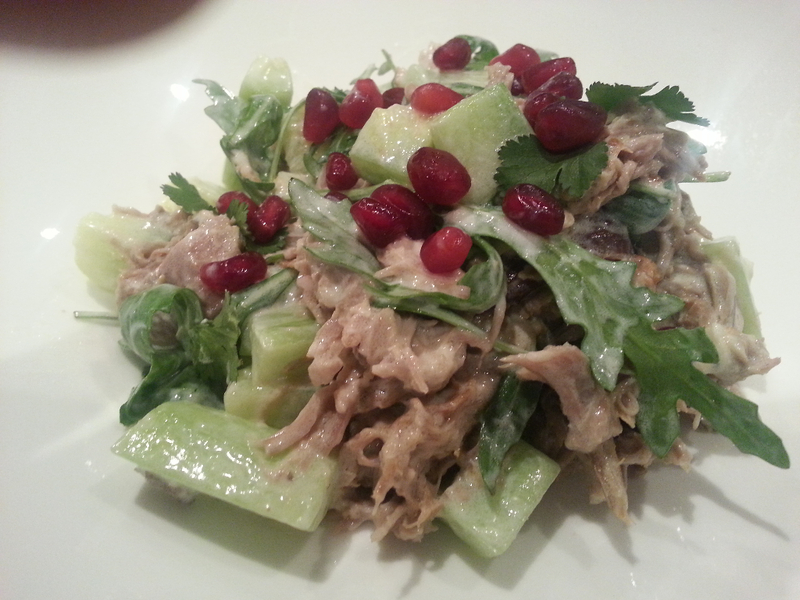 One of my favourite hors d’oeuvres, the combination of slow cooked lamb shoulder with tzatziki, cucumber, pomegranate and coriander is very special. This is a similar recipe to the one appearing in my book which is further embellished with mango. Place the lamb in a slow cooker and top it with the garlic cloves, rosemary and seasoning then drizzle the lamb with the oil. Cover and slow cook for 6 hours. When ready, the lamb will be soft enough to tease apart with two forks. Alternatively, wrap the lamb in foil and cook in a conventional oven at 230 F (110 Celsius). Tease apart the cooked lamb and place it in a bowl and spoon in the tzatziki until the lamb is coated. Mix in the rocket and coriander and continue adding more tzatziki if necessary. Spoon the mixture onto the centre of plates and decorate with the pomegranate seeds. A baby gem lettuce can be enlivened by decorating it with small mandolinned slices of fennel, radish, carrot and asparagus and adorned further with olive pieces and fresh peas. Carefully insert the slices into slots made into the lettuce with a knife. Combine all the ingredients and whisk until the sugar has dissolved. This can keep in an airtight container for a few days. Satay, when made fresh and spiced gives a certain exotic feel to those lucky enough to experience it. I love the way the dish layers against the pickles which balance the spiciness beautifully. Serve this dish with rice. Combine the water, vinegar, sugar, salt, chilli pepper, mustard seeds and crushed peppercorns into a saucepan and dissolve the sugar by bringing the mixture to a simmer. Place the cucumber, celery and mango slices into a china bowl then cover them in the hot pickling liquid. Allow to cool, cover or seal in a clean jar and refrigerate for at least 24 hours before serving. This can be made up to a week in advance and kept in a closed container to prevent evaporation. Wrap a lamb shoulder in foil and cook on a baking sheet in the oven at 180C/350F for 25mins per pound (500 gms). Carefully remove the lamb from the foil and let it settle for about 10 minutes. Carve the lamb into about 20 thin roughly 4 x 4 inch (10 x 10 cms) slices (~ 0.2 inches/ 0.5 cms) thick. Wrap the slices in foils and keep warm. Place all the ingredients into a bowl and whisk them together. Place the sauce into a flat saucepan that has a close fitting lid and warm it gently to simmering point. Add the lamb slices into the pan and gently incorporate the meat into the sauce. Cover the saucepan again and bring the contents back to a simmer for a further ten minutes.